As part of the Zsolnay Festival of Light 2019 Zsolnay Heritage Management Nonprofit Ltd. announced for the fourth time its annual international Zsolnay Light Art Mapping Competition composed on Pécs Cathedral, with a total prize money of €10.000. 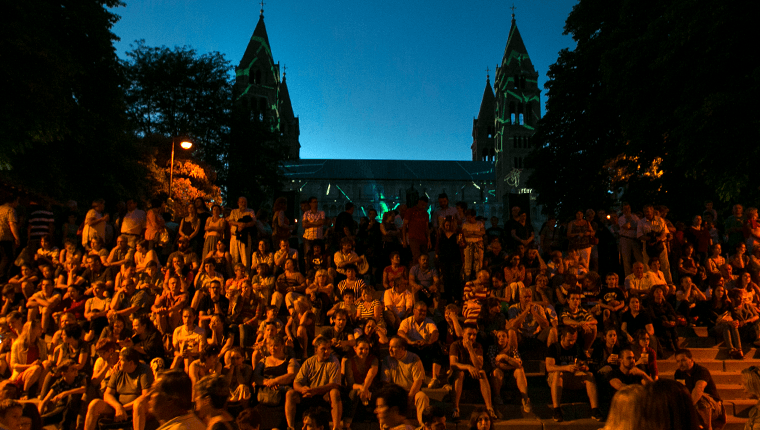 Mappings will be displayed for three nights from June 28th to 30st on the façade of Pécs Cathedral as the main attraction of Zsolnay Festival of Light. As in the previous years, organizing partner and official host of the 2019 competition will be the internationally renowned Hungarian visual arts studio, Glowing Bulbs. A selection of out-of-competition works will be showcased on the night of June 28th – 30st, including Glowing Bulbs’ epic work, ‘The Book of Jonah’. Besides the Southern façade, all four towers and the Cathedral’s roof will be covered again with the magnificent work of competing artists. Winner of the three Jury Prizes will be selected by an international Jury Panel, and shortlisted works will also be open for a public vote for the Audience Prize. For further information on the festival program, please visit http://zsolnayfenyfesztival.hu. We are expecting audio-visual mappings reflecting on the subject, ‘Pure Light’, engaging with the architecture, spirit and traditions of Pécs Cathedral. During selection process the Jury will select a maximum of 10 pieces to be presented live. The Competition is open to emerging and established artists, students and professionals – both individual and group applications are accepted. Individuals under the age of 18 may only apply with written parental consent. By registering, applicants automatically accept competition rules. Contestants will be notified via e-mail upon registration and after each stage. If you have any questions, please contact us at lightart@glowingbulbs.com.